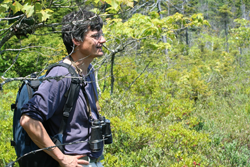 Like Marty, Andy's research interests include animal communication and bird conservation. 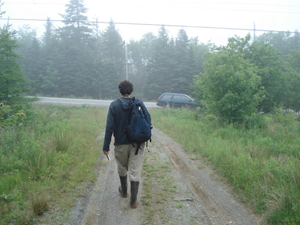 He also teaches Behavioural Ecology and Field Methods in Animal Behaviour. McGregor, P.K. and A.G. Horn. 2015. Communication Networks. In J. Krause, D. Croft, and D. James (eds.) Animal Social Networks: Perspectives and Challenges. Oxford University Press. In press. Haff, T. M., A. G. Horn, M. L. Leonard, and R. D. Magrath. 2015. Conspicuous calling near cryptic nests: a review of hypotheses and a field study on white-browed scrubwrens. J. Avian Biol. In press. McIntyre, E., M. L. Leonard, and A. G. Horn. 2014. Do nestling Tree Swallows (Tachycineta bicolor) respond to parental alarm calls? The Auk 131: 314-320. Reers, H., M. Leonard, A. Horn, and A. Jacot. 2014. Parent-environmental interactions shape acoustic signatures in tree swallows: a cross-fostering experiment. Journal of Avian Biology 45: 123-130. Winkler, D.W., K.M. Ringelman, P. O. Dunn, L. Whittingham, D. J. T. Hussell, R. G. Clark, R. D. Dawson, L.S. Johnson, A. Rose, S. H. Austin, W. D. Robinson, M. P. Lombardo, P. A. Thorpe, D. Shutler, R. J. Robertson, M. Stager, M. Leonard, A. G. Horn, J. Dickinson, V. Ferretti, V. Massoni, F. Bulit, J. C. Reboreda, M. Liljesthröm, M. Quiroga, E. Rakhimberdiev, and D. R. Ardia. 2014. Latitudinal variation in clutch size-lay date regressions in Tachycineta swallows: effects of food supply or demography? Ecography 37:001-009. McGregor, P.K., A.G. Horn, M.L. Leonard, and F. Thomsen. 2013. Anthropogenic noise and conservation. In H. Brumm (ed.) Animal Communication and Noise. Springer Verlag, Berlin. Horn, A.G. and P.K. McGregor. 2013. Information and influence in animal communication networks. In U. Stegmann (ed.) Animal Communication Theory. Cambridge University Press. McIntyre, E., M. L. Leonard, and A. G. Horn. 2013. Ambient noise and parental communication of predation risk in tree swallows, Tachycineta bicolor. Animal Behaviour 87: 85-89. Laughlin, A.J., C. M. Taylor, D. W. Bradley, D. Leclair, R. G. Clark , R. D. Dawson , P. O. Dunn , A. Horn , M. Leonard, D. R. Sheldon, D. Shutler, L. A. Whittingham, D. W. Winkler, D. R. Norris. 2013. Integrating information from geolocators, weather radar and citizen science to uncover a key stopover area for an aerial insectivore. The Auk 130: 23-239. Fairhurst, L., A. G. Horn, and M. L. Leonard. 2013. Nest acoustics and begging call structure in nestling tree swallows. Animal Behaviour 85: 917-923. Lucas, Z., A. Horn, and B. Freedman. 2012. Beached bird surveys on Sable Island, Nova Scotia, 1993 to 2009, show a decline in the incidence of oiling. Proceedings of the Nova Scotia Institute of Science 47: 91-129. Zanette, L., M. Clinchy, M.L. Leonard, A.G. Horn, D.T. Haydon, and E. Hampson. 2012. Brood-parasite-induced female-biased mortality affects songbird demography: negative implications for conservation. Oikos 121: 1493-1500. Farmer, R.G., M.L. Leonard, and A.G. Horn. 2012. Observer effects and avian call count survey quality: rare-species biases and overconfidence. The Auk 129: 76-86. Leonard, M.L. and A.G. Horn. 2012. Ambient noise increases missed detections in nestling birds. Biology Letters 8: 530-532. Marques, P., M.L. Leonard, A.G. Horn and A. Contasti. 2011. How nestling tree swallows (Tachycineta bicolor) integrate their responses to hunger and signalling by nestmates. Ethology 117: 163-170. Horn, A.G. and M.L. Leonard. 2010. Parent-offspring signaling. In M. Breed and J. Moore (eds. ), Encyclopedia of Animal Behavior. Elsevier Inc., Philadelphia. Magrath, R.D, T.M. Haff, A.G. Horn and M.L. Leonard. 2010. Calling in the face of danger? How predation risk affects acoustic communication by parent birds and their offspring. Adv. Stud. Behav. 41:187-253. Leonard, M.L., A.G. Horn and A. Dorland. 2009. Does begging call convergence increase feeding rates to nestling tree swallows? J. Avian Biol. 40: 243-247. Horn, A.G. and M.L. Leonard. 2008. Acoustic interactions in broods of nestling birds (Tachycineta bicolor). J. Comp. Psychol. 122: 298-304. Leonard, M. L. and A.G. Horn. 2006. Age-related changes in signaling of need by nestling tree swallows (Tachycineta bicolor). Ethology 112: 1020-1026. Leonard, M.L. and A.G. Horn. 2005. Ambient noise and the design of begging signals. Proc. Roy. Soc., Biol. Sci. 272: 651-656. Leonard, M.L., A.G. Horn, and A. Mukhida. 2005. False alarms and begging in nestling birds. Anim. Behav. 69: 701-708. Horn, A.G. and M.L. Leonard. 2005. Nestling begging as a communication network. In P.K. McGregor (ed. ), Communication Networks and Animal Communication. Cornell Univ. Press, Ithaca, NY. Zink, R.M., J.D. Rising, S. Mockford, A.G. Horn, J.M. Wright, M. Leonard, and M.C. Westburg. 2005. Mitochondrial DNA variation, species limits, and rapid evolution of plumage coloration and size in the Savannah Sparrow. Condor 107: 21-28. Shutler, D., M.L. Leonard, A.G. Horn, R. Shutler, and D.J.T. Hussell. 2004. Breeding between Tree Swallows from the same brood. J. Field Ornith. 74: 353-358.